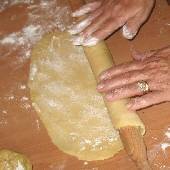 This recipe for phyllo is perfect for making country pies. It’s rolled out with a rolling pin, which is slightly different than using a pasta machine. The quantity is for a large pan commonly used in Greece, similar in size to a large roasting pan. The phyllo crust is great for country-style meat pies, greens and spinach, and with other heavy fillings. This is not a light pastry phyllo sheet recipe. Make a well in the flour and add 1/2 cup of olive oil, flour, wine, vinegar, beaten eggs, salt, pepper, and water in a large bowl or tub. (Start with 1 cup of water and add more to make a soft dough.) 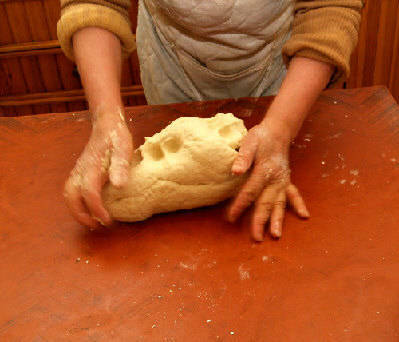 Knead by hand until the dough no longer sticks to hands and is smooth and elastic, 10 to 20 minutes (depending on kneading style, flour, and other variables). the biggest piece to go on the bottom should be big enough to cover the bottom of the pan, up the sides, with a little overlap. the piece to go in the middle will be the smallest, reaching just to the insides of the pan. the piece to go on top should reach from edge to edge, going slightly up the sides. Use the remaining 1/2 cup of olive oil to brush the bottom and sides of the pan, and then the tops of the middle and top phyllo (not the bottom) when making the pie. Making the pie: The filling goes on top of the bottom sheet, and both remaining sheets go on top, the smallest first, then the top crust. The top crust can be gently tucked in around the sides or rolled into a crimped crust with the bottom sheet, depending on your recipe and preference. 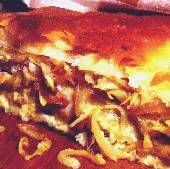 For a smaller pan: This recipe is for a rectangular pan, at least 16×13 inches (similar to a large roasting pan). Either reduce the recipe for a smaller pan, or use only part of the dough. Leftover dough, well wrapped in plastic, will keep in the refrigerator for about 10 days. Use it to make smaller baked pies or fried filled phyllo pies.